Parents, students and staff at Gilmore Lane Elementary protest the shared-facilities plan proposed by Jefferson County Public Schools. Parents, teachers and students of Gilmore Lane are not happy with a proposed closure. 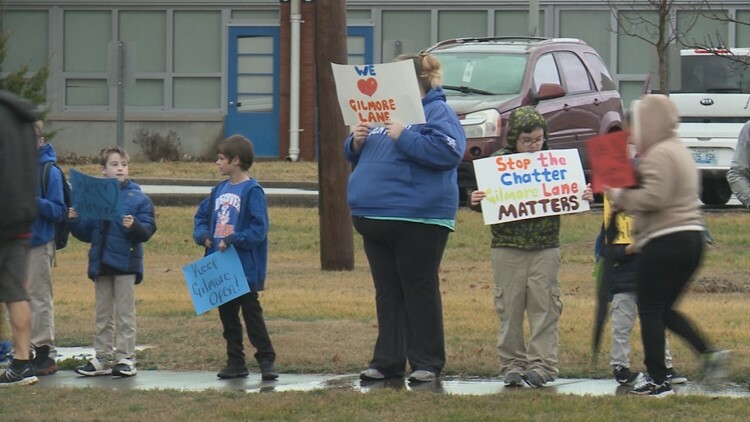 LOUISVILLE, Ky. (WHAS11) – Jefferson County Public Schools’ plan to close Gilmore Lane Elementary has drawn push back from both parents and teachers. Parents, teachers and students held a walk-in Tuesday to express how upset they are. The school system wants to have Gilmore Lane students move to Indian Trail Elementary. An estimated 270 students attend Gilmore Lane. Second grade teacher Nicole Brown doesn’t think things will go smoothly. “That's not going to happen. Indian Trail does not have enough room for our students and that means most of the students will be shipped throughout the district, including my daughter and I'm uncertain what's going to happen to her," she said. There are 11 total schools that would be affected by the district's facilities plan. JCPS Superintendent Dr. Marty Pollio will meet with the parents and teachers of both schools before the school board votes on the final plan which could take place in February or March.